Yesterday on NPR I heard a review of a new book on the history of Los Angeles. It sounded fascinating, so I immediately went to the Taschen store at the Farmers Market and bought it. 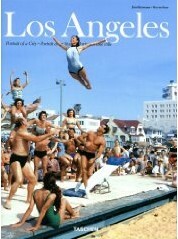 Los Angeles: Portrait of a City, is a huge, 571-page book containing hundreds of photographs of the city’s history from 1849 on. Oversized, with lavish photography, it documents every era of the city from Spanish pueblo to modern metropolis. The archival photographs from the early days are especially fascinating; I can almost see my great-grandparents and grandparents walking through the city scenes portrayed. It gives a wonderful texture to the lives they lived. Taschen produces high-quality art books, and the price is not cheap. But if your ancestors lived in Los Angeles, you will not regret the price.